This lovely Yin Yang is handcast and hand-finished in solid American Pewter with a shiny finish resembling antiqued sterling silver. 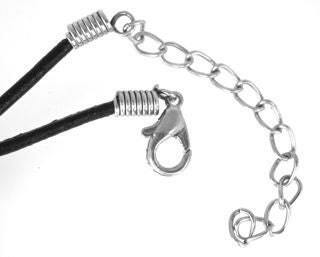 The Yin Yang is a 2 piece pendant that comes on two 18" genuine leather cords with a lobster claw clasp and 2" extension chain, or you can request one of our additional necklace options below for either piece. Yin Yang is the Taoist symbol of the interplay of forces in the universe. 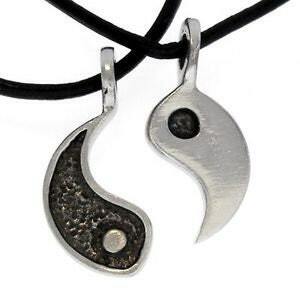 In Chinese philosophy, Yin and Yang represent the two primal cosmic forces in the universe. Yin (moon) is the receptive, passive, cold female force. Yang (sun) is masculine ~ force, movement, heat. The Yin Yang symbol represents the idealized balance of the forces ~ Equilibrium in the Universe.